A great guide who was very well informed with the history of the ancient city of Ayutthaya. The River Cruise home was so pleasant. A wonderful day that I would recommend. Fun, friendly and knowledgeable tour guide, and great sites. The tour guide was trying to sell us Chinese medicinal herbs the entire time. It was so unprofessional. The entire commentary while driving was a sales pitch for these herbs. There was little/no information on the history or locations we were passing thru. A complete and total waste of money. The entire day was spent in a tourist trap. AWFUL! Needless to say we found our own way back to the hotel. Encore un excellent guide, faisant preuve de beaucoup d'humour. La partie Palais royal de Bang Pa-In ne nous a pas du tout intéressé, trop moderne et en opposition avec ce que l'on vient voir à Ayutthaya l'ancienne capitale. 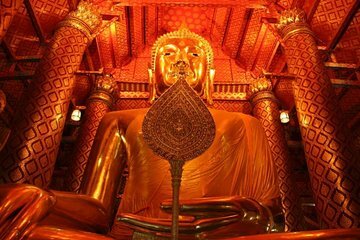 Par contre, tout le complexe de Wat Maha Tat est formidable et immanquable. Le retour en croisière avec déjeuner est très sympa, et nous permet de découvrir Bangkok vue du fleuve. Well organised tour. Great tour guide who was informative and very engaging. Attractions and transport just as I'd hoped and expected. Lunch was delicious. A great value for money day trip.